Stars' Adam Harding cuts through the Flyers defence. There were some good opportunities for both sides in the opening five minutes but neither team could get ahead early on. Fife went in front when Peter LeBlanc faked a shot, then sent a pass through to Daniel Gauthier and he slipped the puck over the pads of Travis Fullerton at 9:01. Stars had a great chance in the final minute of the first period as they worked the puck forward and Emerson Hrynyk was on the end of the move but his shot could not beat Jordan Marr. Dundee started the middle period well and levelled matters when a great interception by Gabriel Lévesque in the neutral zone allowed him to play Marc-Olivier Mimar through on goal and he beat Marr up high at 23:48. However, Flyers responded quickly as Liam Heelis beat Fullerton narrowly on the far post at 24:24. And the Fife men doubled their advantage when Jim Jorgensen’s slapshot was redirected by Chase Schaber and that put the Kirkcaldy side ahead 3-1 at 34:54. Todd Dutiaume’s men were in top gear as Heelis put the puck in the back of the net moments later but the goal was ruled out as delayed penalties against Omar Pacha and Shayne Stockton caused the play to be halted before the goal could count. In the final period, Dundee continued to search for a way back into the game, as Lévesque was flying down the ice before he put the brakes on and fired a wrist shot that was saved by Marr, but the rebound was loose under the Fife netminder and the whistle went before anything could happen. Fife grabbed a fourth goal when the puck sprung back off the boards behind the goal of Fullerton and Schaber was there to put it high past the Dundee goalie at 48:20. Brian Hart picked up a slashing penalty and that gave the road team a chance to extend their lead and that they did. Schaber bagged his hat-trick as he beat Fullerton with a quick slapshot at 51:02 to make it 5-1. Stars started to build pressure in the Flyers zone and Lukas Lundvald drew the attention of Marr before sending the puck to Jordan Cownie and he made no mistake in finding the twine at 52:59. An empty net goal for Carlo Finucci gave the visitors their sixth goal at 58:16 and that secured the points for Fife as they sealed a 6-2 win in the final meeting between Dundee and Fife this season. It would take a miracle for Pacha’s men to make the play-offs, but they gave it their all and refused to give up on their dream. On Saturday, Flyers moved level with Belfast Giants on 66 points with a battling win in Northern Ireland, coming from behind to record a 5-2 success. Charlie Mosey (2), Shayne Stockton, Peter LeBlanc and Russ Meyer were on target for the Kirkcaldy men. 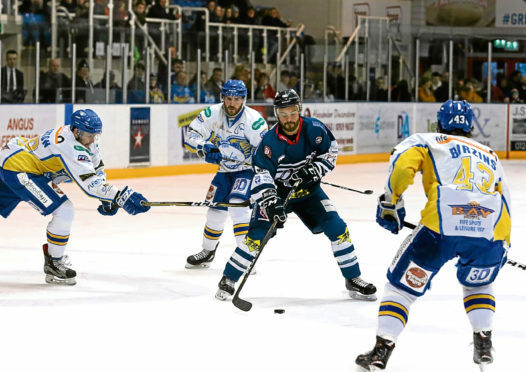 However, Stars’ play-off hopes suffered a severe setback as they went down 7-3 to Coventry Blaze. Dundee’s goals were scored by Marc Olivier-Mimar, Lukas Lundvald and Cody Carlson.